Au premier étage, nous montons voir Abbas K. Abbas, patron du département de recherche des antiquités disparues. Le sympathique quinquagénaire moustachu ne cache pas son désarroi. Il est chargé de scanner la presse mondiale et le maximum de catalogues des salles d'enchères pour essayer de repérer les ventes d'objets volés dans son pays. Pour effectuer ce travail de titan, il a trois employés (un seul lit l'anglais), deux ordinateurs antédiluviens et "pas de budget" pour se rendre sur le lieu d'une vente suspecte. The Iraqi government should be funding this (as they should be funding the antiquities police), of course, and it is just one more sign of the government's negligence, incompetence, or perhaps corruption with regard to its own cultural patrimony. But in the case of the museum, the largest source of funding in the past few years was not the Iraqi government but the Bush administration's last-minute $17 million. Presumably those delivering the money were also helping the museum officials figure out how to use it best. One can only wonder why it is that so little of that funding was allocated to Abbas' department that he cannot afford even up-to-date computers, much less to fly to London or New York to examine artifacts that may be showing up at Christie's or Sotheby's. Who Stole the Iraqi Torah, and How Did It Get Out of Iraq in the Middle of an Invasion? One worth watching. This investigation (who, exactly, in the US is going to do the investigation is an important question) may yield some interesting insights into what was going on behind the scenes before and during the invasion to facilitate the taking of the scroll by US troops (or other authorized personnel) during a period when, we are told by defenders of the military, there were not enough troops to secure the Iraq National Museum. Vance, who traveled across the country for the session, said his job is hindered by a lack of manpower; he and two other officers are responsible for watching over about 3 million acres. How do earrings from one of the most spectacular archaeological finds of the 20th c. end up on the auction block at Christie's? The earrings were found after they offered for sale at auction at Christie’s in New York last December. The catalog listed them as having been acquired by the owner before 1969, the year before a UNESCO convention made it more difficult to trade in antiquities. The earrings were recognized by Iraqi archaeologists as part of the treasures of Nimrud, excavated in 1989 when an Iraqi team discovered a royal tomb overlooked by previous British excavations. 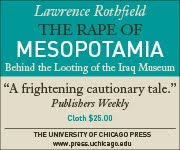 They were believed stolen from the Baghdad Museum before the collection was put into safekeeping in bank vaults before the 1991 war with the US over Mr. Hussein’s invasion of Kuwait. Christie’s, which had put opening bids at $45,000 to $65,000 for the earrings, withdrew them after the Iraq Embassy launched a formal claim. As Arraf notes, the Nimrud treasures are "considered one of the most spectacular finds of the 20th century, on a scale of the gold found in King Tut’s tomb." One would think such objects would be easily recognized by experts. And yet, somehow, they appear at auction at Christie's with a phony provenance. Either Christie's authenticators are incompetent, or Christie's is simply leaving the task of spotting illegitimate antiquities to the archaeologists. Either way, it is disgraceful.